Software: NetEnt, Microgaming, Playtech, IGT, WMS Interactive, NextGen, Endemol Games, Blue Gem Gaming, QuickSpin, and Eyecon. Games Available: Over 400 games, including: Video slots, Video poker, Blackjack, Roulette, and Classic slots. PowerSpins Casino is a NetEnt casino that is operated by BGO Entertainment Limited. The company is licensed in Alderney and also holds a UK Gambling License. This casino has a vibrant, power theme throughout where players can earn ‘bolts’ or loyalty points when they make deposits each day. PowerSpins Casino has a huge selection of over 360 slots from which to choose. The casino is powered by games from the top casino software providers such as: NetEnt, Microgaming, Playtech, IGT, WMS Interactive, NextGen, Endemol Games, Blue Gem Gaming, QuickSpin, and Eyecon. PowerSpins Casino is compatible on all devices (mobile, desktop, or tablet). 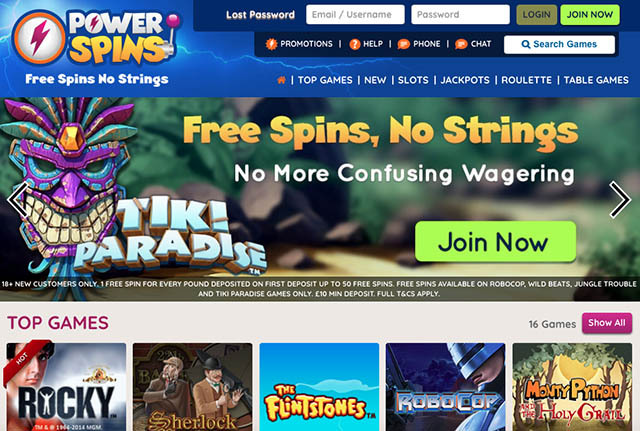 Check out the PowerSpins Casino Review below to get your daily jolt of electricity! 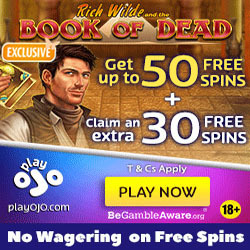 New players receive Zero wagering Free Spins or Real Cash Free Spins with each £1 deposited. You can get up to 50 Real Cash Free Spins when you make your first deposit at PowerSpins Casino. Play your free spins on any of the following games: Robocop, Wild beats, Jungle Trouble, or Tiki Paradise. The minimum deposit to receive this bonus is £10. Players may only accept one bonus per person/email/IP address/household. 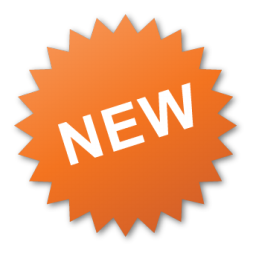 Neteller and Skrill deposit methods are excluded from the Welcome offer. 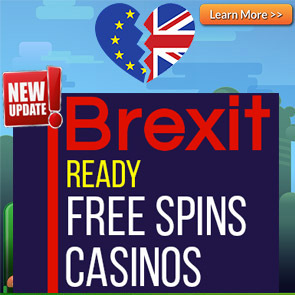 Free Spins received through the Welcome offer carry no wagering requirements. The deposit options at PowerSpins Casino are: Visa, Mastercard, Maestro, Neteller, Skrill, Paysafecard, and PayPal. USA, US/GB Virgin Islands, US Minor Outlying Territories, Spain, Italy, France, Afghanistan, Libya, Sierra Leona, Iran, Iraq, Nigeria, Zimbabwe, Mali, Sudan, Belgium, Greece, Israel, Turkey, Switzerland, Hong Kong, Denmark, Estonia, Bulgaria, Cyprus, Macau, Philippines, Singapore, Hungary, the UAE, Romania, Portugal, the Netherlands, and Russia. The customer support team is available to answer any of your queries via Email, or filling out the Online Contact form.